Professor Anne Graham is the Founding Director of the Centre for Children and Young People (CCYP). 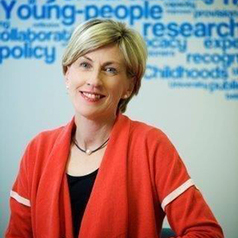 Under Anne's leadership the CCYP has built the reputation of Southern Cross University as a key player regionally, nationally and internationally in providing high quality, high impact interdisciplinary research aimed at improving policy and practice in key areas of children and young people's lives. Over the past 12 years Anne has led over 60 research projects, including 5 ARC Linkage grants and 2 ARC Discovery grants, focused primarily on children's rights and wellbeing in different contexts (schools, family law processes, juvenile justice, disability services), as well as ethical issues in research involving children, and teacher (and other professionals’) learning. This program of research has attracted well over $8 million in funding to date. To help ensure relevance and strong industry engagement, Anne’s research has been undertaken collaboratively with state and Commonwealth government departments, as well as key statutory bodies, major national and international NGOs, and many other community based organisations. Anne has published extensively in scholarly journals and books, and provides a substantial number of presentations, seminars and collaboratively run workshops to help ensure partner organisations benefit from research undertaken with the Centre. Anne's research has also resulted in her authorship of a highly successful psycho-social education program, Seasons for Growth, which provides children, young people and parents with knowledge and skills to adapt to significant change in family life following death, separation, divorce and other loss experiences. Over 300,000 children and young people in 5 countries have now participated in the program. Research Interests: children and young people’s rights, social and emotional wellbeing and safety within different family, school and community contexts; children and young people’s experiences of loss and grief; participation at school; participation in family law processes; relationships; ethical issues in researching with children & young people; teacher learning; ethical practice in working with children; interdisciplinary understandings of childhood; effective knowledge translation. Methodological Expertise: a wide range of mixed-method and qualitative methodologies; participatory research design; program evaluation; on-line survey development; young people as co-researchers. Industry Collaboration Interests: State and Commonwealth government departments (including Family and Community Services, Social Services, Education, Juvenile Justice, Legal Aid), as well as key statutory bodies (such as the NSW Advocate for Children and Young People, the Australian Human Rights Commission), major national and international NGOs (such as UNICEF, Save the Children, Childfund Australia, The Smith Family), and many significant regional organisations (disability and out-of-home care services, Catholic Schools Offices, local councils, Family Relationships Centres).